I hang out in a bunch of Facebook groups full of entrepreneurs, and I see a lot of people asking which platform to use for their budding business. I may be a little biased, but I think WordPress is the best platform to start a website on. Aside from other reasons, WordPress is more flexible to grow on, and I’d hate to see ambitious entrepreneurs stalling in their growth because their platform doesn’t accommodate what they want to do, and they don’t want to take the time to move to a new platform. Domain names are the address of the website – mine (for this site) is beyondtheoffice.com. To get a domain name, you have to use a domain registrar and find one that’s available, and register it to you. Typically, registrations are for 1 year terms, but you can usually register yours for longer periods of time, if you want to. My preferred domain registrar is NameCheap – they have competitive rates, great customer service, and ethical business practices. Hosting is where your website lives so people can find it. If you website is like a house, the hosting is the land your house is built on. Hosting companies provide special computers that can make your website available to the world, and you rent the space from them. 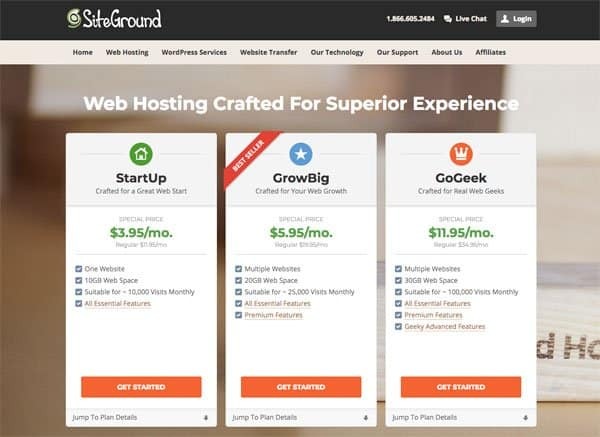 There are tons of different hosting companies in the world, but my preferred hosting company is SiteGround. If you’re just starting out, then you’re probably okay with starting with their lowest plan, and you can always upgrade if you want to add more websites or need room to grow. Note: Using SiteGround (or most hosting companies) will require that you do your own backups and updates. Backups and updates are necessary for security and performance and not terribly hard to do. But, if you don’t want to do your own maintenance (which is what backups and updates are typically referred to) you can hire someone to do the WordPress maintenance for you (hi!) or use a WordPress managed hosting company like Flywheel or WPEngine. The Software/Platform you use for your site can be a tough decision – I know there’s a lot of choices out there. WordPress is the most popular (powering over 30% of the world’s top 1-million websites). It’s flexible, it’s scale-able, its customizable – it’s almost like magic. Fortunately, technical companies like NameCheap and other domain registrars realize that many of their customers are not super technical people, and tend to make the buying process pretty easy. Before we go down this road, I want to let you know that some hosting companies will include a domain name when you buy hosting from them. This is the easier route, but I have learned from experience to keep my domain name and hosting separate. This way, if you ever have an issue with your hosting company, you can point your domain to new hosting without them potentially holding onto your domain name. I have not had any issues with SiteGround that make me think that I would need to do this, but it’s still something I practice for safety. First, you’ll need to make sure your preferred domain name is available. Go to NameCheap.com and enter your domain selection in the search field. On the next screen, you’ll see the search results. The domain is available as you typed it, it will show at the top, as well as some suggested other domains below it. If the domain you want isn’t available, look at the alternatives to see if there’s one you want to use, or search for another one. When you’ve found an available domain that you want to use, click on the Add to Cart button. Then you can click the View Cart button to complete your transaction. You’ll need to create an account with NameCheap to finish the transaction. 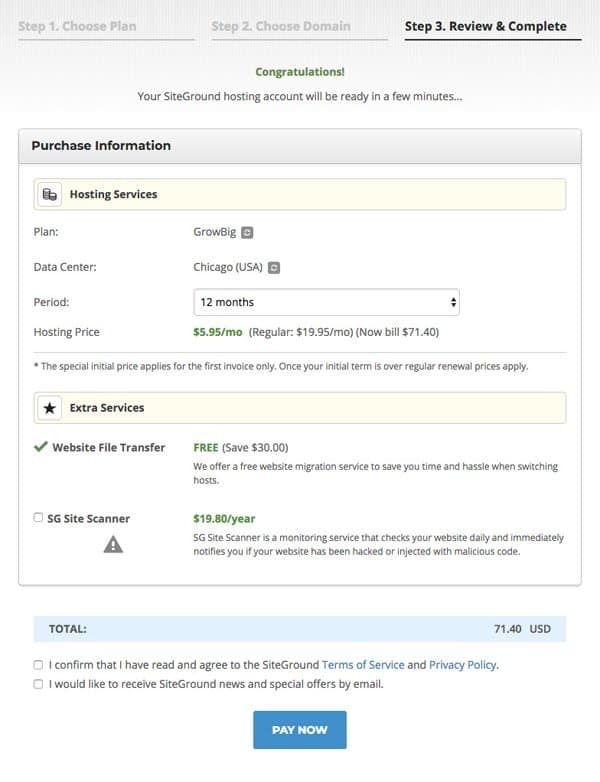 Go to SiteGround.com and select WordPress Hosting to get started. They offer three hosting plans to choose from, but the StartUp plan is a good choice when you’re just starting out. You’ll be able to upgrade to another plan later if you need to. On the next screen, you’ll be asked to identify the domain name you want to use with your hosting. If you’ve already registered your domain name, be sure to select the correct option and enter the domain name you’re using. You’ll need to create an account to finish the transaction. SiteGround offers a service called SG Site Scanner to help protect your site from malware. You can choose to purchase this if you want to. You can also choose the length of time you’d like to purchase hosting for. If you registered your domain name separately (not with SiteGround) you now need to tell the domain registrar where to send people when they are trying to access your website. When you first log in to your SiteGround hosting account, you’ll be taken to your account page. This page has useful information you’ll need for various things, including connecting your domain to your hosting. Look for the Nameserver settings under Account DNS – they are usually something like ns1.sitegroundXXX.com and ns2.sitegroundXXX.com. Take note of these – write them down, or keep them open in a separate tab or window. Now open a new tab/window and log in to your domain registrar (NameCheap if you’ve been following my recommendations.) Click the manage button by your shiny new domain name. Look for the Nameservers section and select Custom DNS from the dropdown. Enter the nameservers (Account DNS) that you got from SiteGround and click on the checkmark to save your entry. Now that you’ve got your domain and hosting situated and connected, you can install WordPress and start building your site. One quick step before you start the install process – I want to you create a SSL Certificate to use for your site. I promise that it’s quick and painless, and SiteGround offers this for free. I won’t spend a lot of time here explaining why you should have this, but if you’re interested in reading more, I have a blog post you can read. Your site will work without it, but it’s good idea to have and it’s less complicated to do it now before you set up your site than it is to add it later. Back on your SiteGround account page, click on the “Go to cPanel” button. On the cPanel page, look for the Security section and click on Let’s Encrypt. Scroll to the bottom to the “Install new Let’s Encrypt Certificate” section. Make sure your chosen domain name is showing in the domain field and then click the Install button. That’s it. Within moments or up to a few minutes, you should see your domain showing above that section showing an active SSL certificate with Let’s Encrypt. Now, we’re ready to setup WordPress. 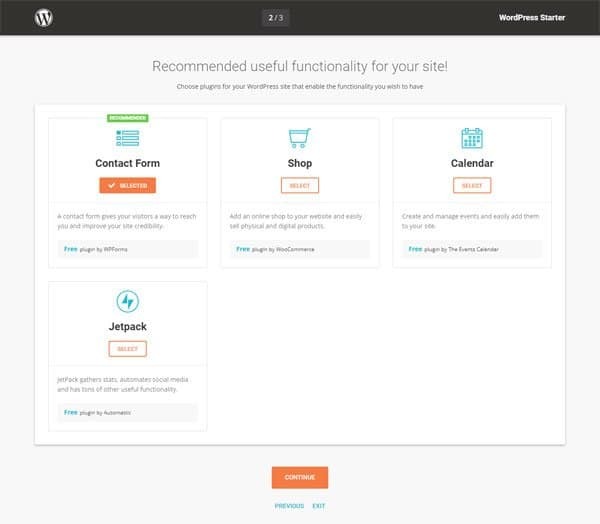 On the cPanel page, look for the AutoInstallers section, and select the WordPress autoinstaller. 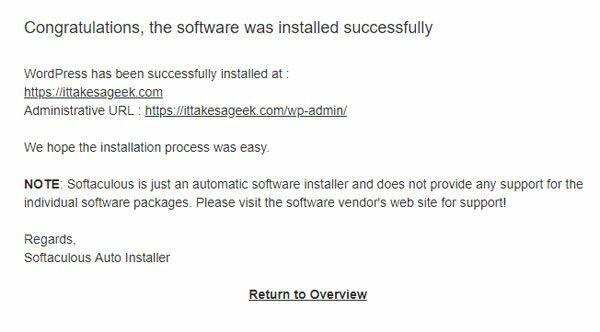 On the Installer page, click the Install Now link to get started. Choose Protocol – if you set up the SSL Certificate with Let’s Encrypt, you can select https:// or https://www. If not, choose on of the http:// options. I like my sites to not use the www because i think it looks neater, but one is not necessarily better than the other – just a matter of preference. Choose Domain – Unless you have more than one domain on your account, your domain should be automatically selected here. Make sure it’s the right one. In Directory – you can leave this blank in most cases. Site Name – What’s your website name? Site Description – Enter your tagline, or feel free to leave blank, You can change this later, if you want to. Admin Username – can be anything you want, but should not be “admin” or “administrator” or anything obvious like that, as that will make your site more vulnerable to hackers. Admin Password – enter the password you would like to use. Must be a strong password. Admin Email – enter your primary email address. You’ll get notifications from the site at this email address, so make sure you use one you check often. Select Language – English is the default. If you need another language, select it here. 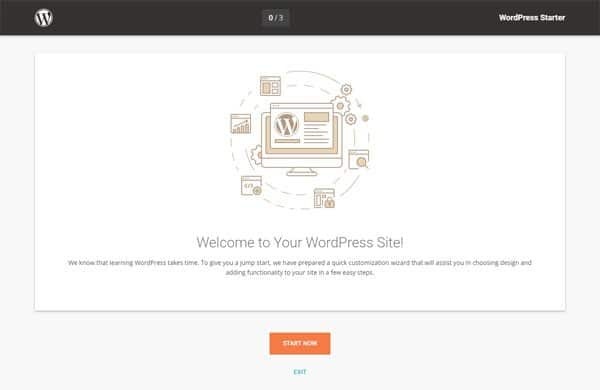 WordPress Starter – SiteGround now offers a startup process for your WordPress site that helps you choose a theme and some other options. It’s helpful to go through, and I will be showing you that later. If you want to read through that part to help you decide, go for it. Advanced Options – you can set specific database name and table prefix here if you want. What SiteGround uses by default is fine, so you don’t need to change it unless you really want to. Click the Install button when you’re done. You’ll get your confirmation message on the next screen. From here, you can click on the Administrative URL for your website to log into the back end (called the Dashboard) and get started. If you selected the WordPress Starter option when you were setting up your site, you’ll have a few additional screens to work through when you log in to your Dashboard for the first time. 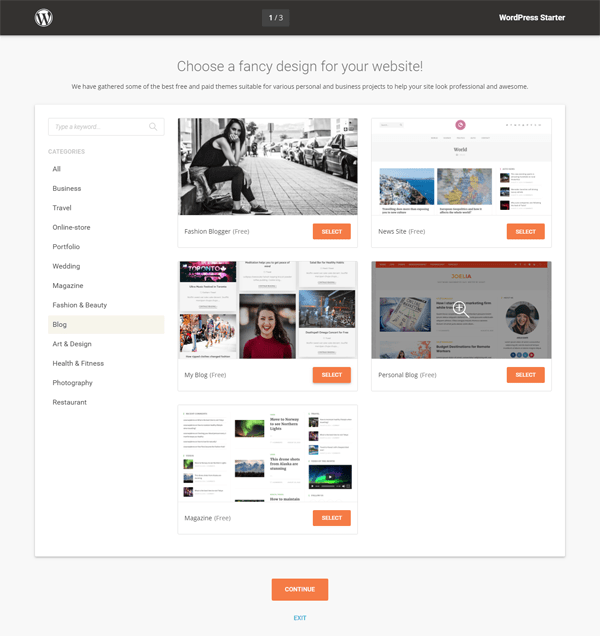 In the SiteGround WordPress Starter, you’ll be asked to pick a design for your website. Browse through the options and find one that you feel would be a good fit for you and your goals. Don’t worry – you can change it pretty easily later if you change your mind, but this will give you a good head start on the look of your site. Next, the Starter will suggest some common plugins that you might want to use on your site. I recommend getting the Contact Form plugin suggested, because I think every site site should have a contact form. The other options are for adding a e-commerce shop or events calendar to your site, as well as a multi-functional plugin that can be used to help you publicize your site but its value is highly contended – some people swear by it, and some hate it. If you think you might have a use for one of them someday but aren’t sure right now, I would suggest waiting. These plugins are easy to add later, but adding them now could lead to conflicts and confusion that is better avoided for now. Ultimately, though, the choice is up to you. Yoast SEO for helping you optimize the content of your site. This is one of the most popular SEO plugins in the WordPress world. I recommend grabbing the Google Analytics and Optimize for SEO options, but these can also easily be added later if you want to. Finally, click on the Complete button and you are ready to go. 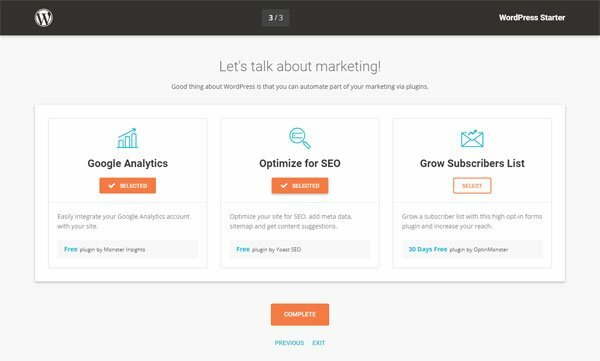 You’ll be sent to a Dashboard page and from there you can further customize your site and start adding content. This whole process shouldn’t take more than an hour, so try not to get overwhelmed. But also make sure you have set aside uninterrupted time to work through this process – don’t start 5 minutes before the baby is due to wake up from a nap or right before a client meeting. Congratulations! You have set up your own WordPress site. I can’t wait to see what you create with it. Will you please share your shiny new website with me in the comments below? If you’re looking for more guidance on what to do with your site now, check out The WordPress Toolbox. There I offer free and premium courses to help you create, grow, and enhance your WordPress website. Share the post "How to Install WordPress on SiteGround"